What We Do｜MT Partners K.K. 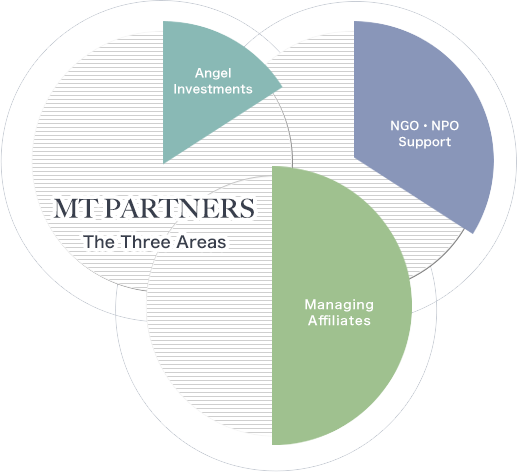 MT Partners supports individuals and organizations that we can relate to. We value the individual or organization's potential, passion and attractiveness over short-term profit and growth, and we support creative businesses that fulfill the three elements of OUR VISION. Below are a few of our portfolio companies and organizations we support. With regards to NGO・NPO Support, we contribute mainly through our involvement as board member. * All new startup investments are currently provided through D4V where Makoto Takano serves as CEO. In principle, no new personal investments will be made to individual companies. Tokyo Golf Academy Co., Ltd.
We contribute mainly through our involvement as board member.